Has the US been defanged, with investors falling out of love with Facebook, Amazon, Netflix and Google? Join us as we walk through the landscape for 2019, looking at the big picture questions and examining the opportunities out there. Join Simon Doherty, Lead Portfolio Manager of the MPS strategies, and David Butler, Strategic Accounts Director on 17th January 2019 at 14:00 BST as we discuss performance for the MPS models over the fourth quarter and what we can expect at a critical juncture for markets. • Overview of the key drivers of strategy performance over the third quarter of 2018. • Summary of the new fund ideas incorporated into the strategies over the course of Q3, and the tactical changes made to the portfolios’ asset allocations. • An update on the strategies’ current positioning and Quilter Cheviot’s market outlook for the next quarter. Simon Doherty, Lead Portfolio Manager of MPS. Scott Stevens, Head of Business Development. Join Simon Doherty, head of Quilter Cheviot’s Managed Portfolio Service (MPS), for an overview of the key drivers of performance in Q2 2018, the changes recently implemented to our strategies and an update on our current positioning and asset allocation. The webinar will be hosted by our Head of Business Development, Scott Stevens, and gives you an opportunity to ask any questions that you may have. - Overview of the key drivers of strategy performance over the second quarter of 2018. - Summary of the new fund ideas incorporated into the strategies over the course of Q2, and the tactical changes made to the portfolios’ asset allocations. - An update on the strategies’ current positioning and Quilter Cheviot’s market outlook for the next quarter. Join Simon Doherty, head of Quilter Cheviot’s Managed Portfolio Service (MPS), for an overview of the key drivers of performance in Q1 2018, the changes recently implemented to our strategies and an update on our current positioning and asset allocation. The webinar will be hosted by our Head of Business Development, Scott Stevens, and gives you an opportunity to ask any questions that you may have. - Overview of the key drivers of strategy performance over the first quarter of 2018. - Summary of the new fund ideas incorporated into the strategies over the course of Q1, and the tactical changes made to the portfolios’ asset allocations. Join Simon Doherty, head of Quilter Cheviot’s Managed Portfolio Service (MPS), for an overview of the key drivers of performance in Q4 2017, the changes recently implemented to our strategies and an update on our current positioning and asset allocation. The webinar will be hosted by our Head of Business Development, Scott Stevens, and gives you an opportunity to ask any questions that you may have. - Overview of the key drivers of strategy performance over the fourth quarter of 2017. - Summary of the new fund ideas incorporated into the strategies over the course of Q4, and the tactical changes made to the portfolios’ asset allocations. - An update on the strategies’ current positioning and Quilter Cheviot’s market outlook for 2018. Join Simon Doherty, Lead Portfolio Manager of Quilter Cheviot’s Managed Portfolio Service (MPS), for an overview of the key drivers of performance in 2017, an outlook to 2018, the changes recently implemented to our Euro strategies and an update on our current positioning and asset allocation. The webinar will be hosted by our Head of Business Development, Scott Stevens, and gives you an opportunity to ask any questions that you may have. - Overview of the key drivers of strategy performance over 2017. - Summary of the new fund ideas incorporated into the strategies over the course of 2017 and the tactical changes made to the portfolios’ asset allocations. Join Simon Doherty, head of Quilter Cheviot’s Managed Portfolio Service (MPS), for an overview of the key drivers of performance in Q3 2017, the changes recently implemented to our strategies and an update on our current positioning and asset allocation. The webinar will be hosted by our Head of Business Development, Scott Stevens, and gives you an opportunity to ask any questions that you may have. - Overview of the key drivers of strategy performance over the third quarter of 2017. - Summary of the new fund ideas incorporated into the strategies over the course of Q3, and the tactical changes made to the portfolios’ asset allocations. Join Simon Doherty, head of Quilter Cheviot’s Managed Portfolio Service (MPS), for an overview of the key drivers of performance in Q2 2017, the changes recently implemented to our strategies and an update on our current positioning and asset allocation. The webinar will be hosted by our Head of Business Development, Scott Stevens, and gives you an opportunity to ask any questions that you may have. Join Simon Doherty, head of Quilter Cheviot’s Managed Portfolio Service (MPS), for an overview of the key drivers of performance in Q1 2017, the changes recently implemented to our strategies and an update on our current positioning and asset allocation. The webinar will be hosted by our Head of Business Development, Scott Stevens, and gives you an opportunity to ask any questions that you may have. Join Simon Doherty, head of Quilter Cheviot’s Managed Portfolio Service (MPS), for an overview of the key drivers of performance in Q4 2016, the changes recently implemented to our strategies and an update on our current positioning and asset allocation. The webinar will be hosted by our Head of Business Development, Scott Stevens, and gives you an opportunity to ask any questions that you may have. Quilter Cheviot's David Miller brings to life his weekly Diary of a Fund Manager, which explores and provides perspective on the evolution of some longer-term investment themes. 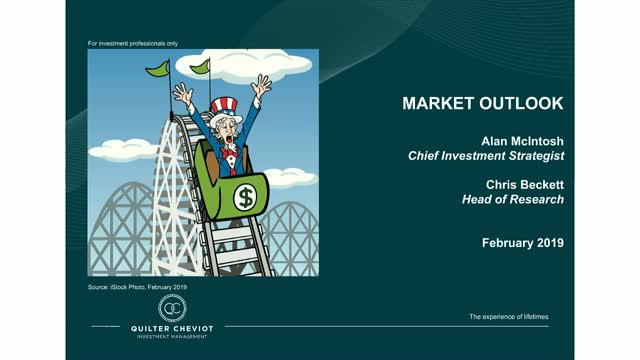 The Quilter Cheviot Investment Management channel provides financial advisers and their clients with live webinars and videos on the latest views and market updates from our investment managers.